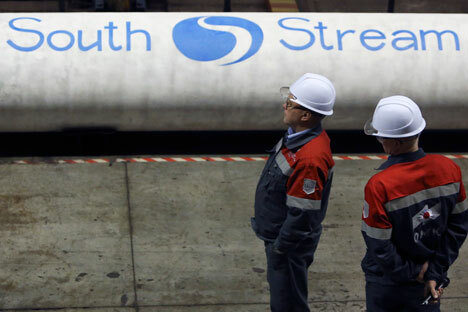 Employees stand near pipes made for the South Stream pipeline. The South Stream project does not exist, Russia has not prepared any new offers to the European Union on it, there is no information that the European Commission has changed its attitude to this issue, Russian presidential press officer Dmitry Peskov said. "There is no South Stream project as such, it is closed. For this reason, no work is being conducted here. The project was halted due to the relevant position of the European Commission," Peskov told reporters, commenting on the statement by Vygaudas Usackas, the head of the EU mission to Moscow, saying that the European Union is ready to consider offers on this project if such offers are made. Responding to a question as to whether Russia is preparing any offers on South Stream to the EU, Peskov said: "No. There have not been any decisions by the European Commission on changing its position on this project." Peskov also said the statement by Usackas needs to be studied in more detail.